I think we can all agree that having friends is a good thing. Having friends at a comedy show also seems good, especially if it’s your birthday and you’re hosting the comedy show. If it sounds like I’m talking about something specific, I am: a comedy show aptly entitled Soooo Many Friends, hosted by Magda Cychowski and Michelle Davis. It’s Magda’s birthday, and she “will need to laugh to fill the void in her soul,” something I’m sure a lot of people can relate to. 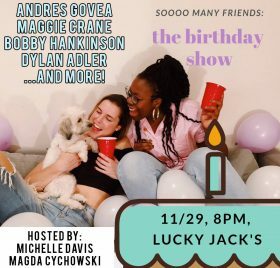 These laughs will (hopefully) be served up by Bobby Hankinson, Dylan Adler, Maggie Crane, and Andrés Govea. 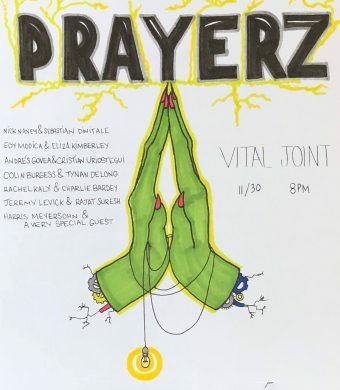 Brian Fiddyment’s Prayerz, a variety show focusing on multimedia comedic performance, has been happening approximately monthly at East Williamsburg space Vital Joint for a decent amount of time now. However, as is the unfortunate fate for many a small and scrappy art space, Vital Joint is pivoting away from hosting shows, so this Friday will be the last time to say your prayerz, at least in this venue. 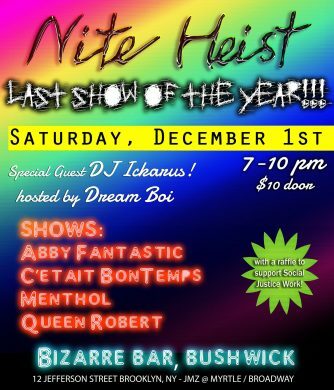 For this one, performers will be pairing up, so expect wonderful weirdness from folks like Rachel Kaly and Charlie Bardey, Nick Naney and Sebastian DiNatale, Edy Modica and Eliza Kimberly, and more. As it’s nearing the end of 2018, recurring shows are gearing up for their last shows of the year. That doesn’t mean they’re going to go away forever once the clock strikes 2019, but there’s something that feels satisfying about closing a chapter, however brief, and reflecting on what you’ve accomplished over the last 12 months. Performer Dream Boi’s monthly drag showcase Nite Heist stages their last glittering show of 2018 on Saturday, with performances galore from C’Etait BonTemps, Abby Fantastic, Menthol, and Queen Robert, plus tunes from DJ Ickarus. Sarah Kinlaw. 2018. Photo: Stephanie Dimiskovski. 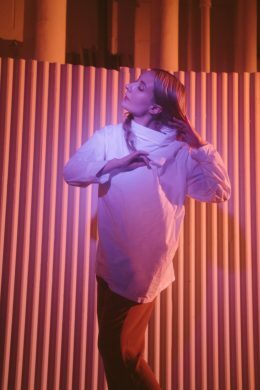 Performance artist and musician Sarah Kinlaw has had her hands in a lot of projects over the years, from co-directing 2016’s massive surveillance-themed movement piece Authority Figure to writing and performing her own music. Her latest piece, created in collaboration with Kathleen Dycaico, Kellian Delice, Quenton Stuckey, and Tara-Jo Tashna, will be staged at MoMA PS1. 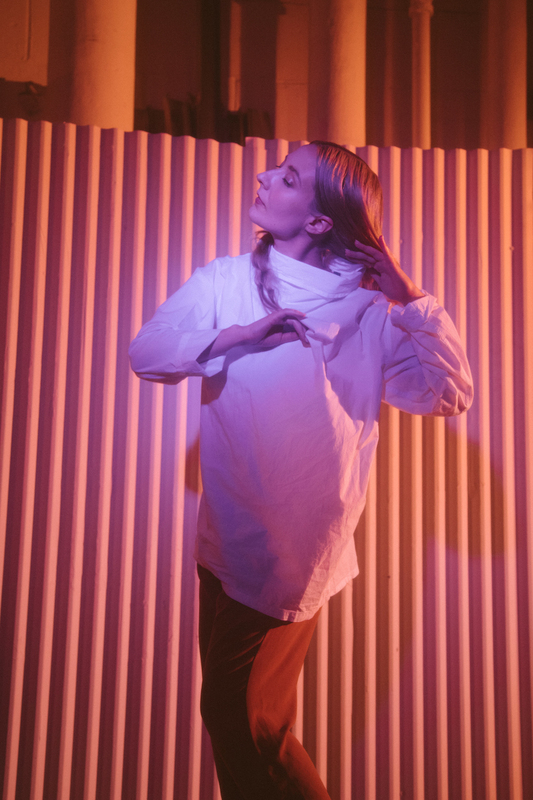 Dance and sound take center stage, as bodies intermingle with industrial fans and an array of onstage microphones that not only serve as traditional voice amplification, but ways to make the very sounds of choreography in motion more tangible for an audience. Plus, you might as well see cool, weird art in Long Island City while you still can, as Amazon’s takeover continues to loom.